Experts say the flooding in the Houston region could have wreaked far less havoc if local officials had made different decisions over the last several decades. But the former head of a key flood control agency strongly disagreed with that take in an interview last year. As the Houston region begins its recovery from the worst rainfall to ever befall a major metropolitan area in modern U.S. history, many flooded-out residents are asking whether local officials could have done anything to mitigate the damage wreaked by Hurricane Harvey. The short answer from scientists and experts: Yes. While Houston — nicknamed the "Bayou City" — is naturally flood prone, hydrologists, environmental engineers, and federal officials told The Texas Tribune and ProPublica last year that unchecked development over the decades has heightened flooding risks. They also say the Houston region must start planning for more intense and frequent rainfall events and move away from looking at the past to predict what might happen in the future. In recent years, some local officials have attempted to strengthen rules to protect from catastrophic flooding, but their efforts have been shot down by politically powerful developers. And then there are the local officials who completely deny it's a problem. 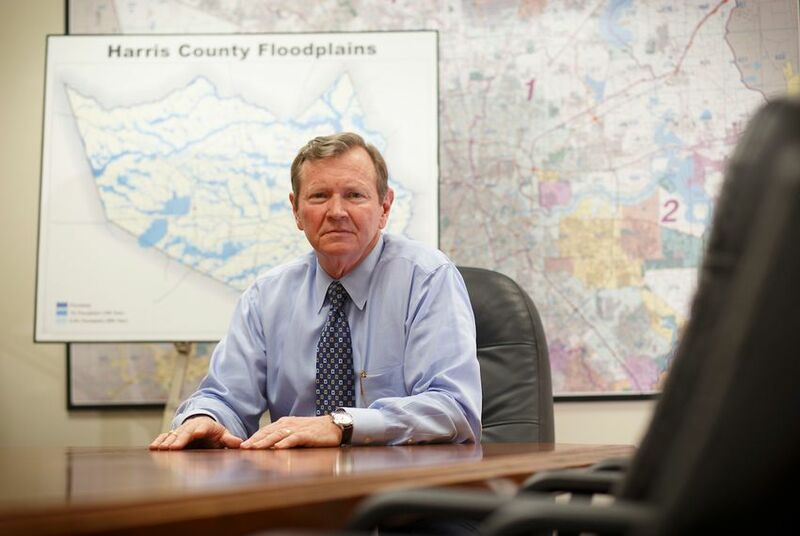 One of them was Mike Talbott, the longtime head of the powerful Harris County Flood Control District, who — during his 18 years on the job — made many key decisions about how the Houston area should cope with its nagging flooding problems. In an interview last year shortly before his retirement — and after two major, back-to-back floods in Houston — Talbott told us he strongly disagreed with nearly everything scientists and experts had told us. Stephen Costello, the city of Houston's new "flood czar" appeared more receptive to alternative solutions, like more green space, but conceded that he had little money or manpower — and said he hoped to pursue smaller, quick-hit projects. Below are edited and condensed versions of our interviews with them last year, shortly after the Tax Day Flood of April 2016. TT: You have seen a lot of pretty big floods and disasters in your time. What is your worst case scenario? Is there anything you are really scared of? MIKE TALBOTT: Not really. We don't have any looming issues, like a New Orleans, or something that’s built below sea level. The big issue is just the extreme rainfall events that we get occasionally. Houston and Harris Country have an incredible drainage system, but it floods occasionally. And it’s just the big rains that we are mostly concerned about. TT: Do you worry about bigger rain events, like what happened in April, during the Tax Day flood? Do you worry about those happening, or happening more frequently? TALBOTT: Not statistically. Everything we do is based off of rainfall [data]. We have got one of the densest rain gauge networks, [so] we are able to look at those statistics. We've had heavy back-to-back rainfalls before. So I don't think it's the new normal. When you talk about a 1 percent chance of happening [in a given year], it can happen. You can flip a coin and have it come up heads 10 times in a row. It's just, statistically, it shouldn't happen, but it can. TT: So you don't think climate change is to blame for the recent floods? TALBOTT: I just don't have any information. I'm not an expert in that field. We had the drought. Before people were talking about climate change, we’ve seen multiple extreme storms in a year. So I don't see this as a huge trend based off of past experience. But there are experts in that field that do look at that. I just haven't seen anything on that. TT: Scientists say climate change will bring more frequent and intense rainfall to the Houston region. Is there any way to take that into account going forward? TALBOTT: When people ask me, "Are you designing for climate change?” I say, "I'd love to, if somebody would tell me what that is." To say, "Well, it's going to be more intense." Okay, give me a number. What's the number I should be using instead of the historical numbers? What is this vision that you have? TT: Do you all consult with experts who look at the potential of climate change to change things? TALBOTT: We haven't discussed, specifically, climate change. TT: Scientists, experts, and some government officials have told us that new development in the Houston region is making flooding worse. You've been quoted as saying that you disagree — that any development since the mid-1980s, when flood mitigation policies were put into place in Harris County, has not made flooding worse. Is that really your take? TALBOTT: Yes. With engineering data to back that up, it's not just my opinion. The mitigation that's being done by new development is absolutely effective. They're building stormwater detention, they're building new channels, and all of it is being mitigated appropriately. Every single development goes through a rigorous review process, and everybody's got criteria manuals that are two inches thick. TALBOTT: No, that's absurd. I'm concerned — A lot of the ink that has gone down after [the Tax Day flood] has been given to critics with an agenda. When somebody wants to claim that, “well, it's because we're paving over all the wetlands and these magic sponges out in the prairie would have absorbed all that water,” is absurd. [During the recent floods], the heaviest rain fell on the prairie, and the prairie did some good, but then it flowed off of the prairie, and all the runoff from the prairie is what flooded that development. A lot of the critics, they have an agenda, and the media has given them a platform without consulting with other experts. I'm not saying they're not experts, but their agenda to protect the environment overrides common sense in a lot of cases. TT: What's their agenda? What do you think they're motivated by? TT: You really don't think that any of the new development that's happened in the past 20 years has had any impact on flooding? TALBOTT: No, it hasn't. The land development issues are being mitigated quite well, and I've got the engineering data to back it up. TT: It sounds like we’re talking to people who live in two different cities, or universes. Not a single expert or scientist that we've spoken to has said that new development has had no effect on flooding in Harris County. TALBOTT: You need to find some better experts. TT: Who should we talk to? TALBOTT: Starting here, with me. But, you know, some of these scientific experts have never built or designed anything. They're not in the review process. Most of them that I know of haven't looked at the design criteria. They don’t know what’s actually happening. TT: Is there anyone outside of the flood control district? Other academics or experts who could speak to what you're saying? Or engineers? It sounds like you're criticizing academics, and saying engineers know better. TALBOTT: Well, the practicing engineers that are actually designing and building these things, and studying the impacts. The design criteria that we developed is all based on science, and the records that we have. The academic side of things is important, but where the rubber meets the road is the actual practice of designing and building something, and being responsible for what you build is the other aspect. TT: That's a lot of what experts we’ve interviewed are saying. They're worried that folks who are building aren't always being responsible, and that there's no way for regulators or anyone else to check up on every single development. TALBOTT: But that's a theory. Show me their facts. What are they basing that on? This is another irritation for me, is that the critics can say whatever they want, and I have to prove they're lying. They're just not in touch with what's really going on. TT: So, Sam Brody of Texas A&M University, Phil Bedient, an engineer at Rice University. They're wrong? In 2016, after the second flood-producing storm in two years, newly-elected Houston Mayor Sylvester Turner appointed former Houston city councilman Stephen Costello as the city's first “flood czar” to assess the problem and potential solutions. When we spoke to Costello last year — a day after he'd addressed a crowd of angry residents whose homes had recently flooded — he acknowledged his role as more political than action-oriented. TT: At the meeting last night residents said they've never flooded before, that this is all new, and you told them, “We're trying to help you and fix your problem." Do you think that this is a new problem for them? STEVE COSTELLO: Some of them have lived there all their lives and they've never experienced flooding, but the question is: Have they had a rainfall like they've had over the last couple of years? Maybe, maybe not, I don't know. There is an ongoing problem that the city is faced with, with our residents. They don't trust the city, and particularly because we don't have zoning, and they're concerned that developers run the development out here, and there's no regulatory control, which is just the opposite. There is. TT: Do you think that the new development is properly mitigating for its impact? COSTELLO: For open disclosure I made a very successful living at working for the development community [through his engineering firm]. We built massive planned communities. Developers will follow criteria. What you always have, in any type of industry, is the outlier and some who try to push the envelope and some who don't necessarily follow criteria. What happens is that new laws and new criteria are written to address those issues. I think moving forward, because we are having a lot of public concern over our criteria, that we're going to need to explore that, and that's what I've told the mayor that we'll have to do. TT: Are you optimistic that criteria is actually going to change? It seems very difficult politically to do that. COSTELLO: The criteria has changed over the years since I've been in the business, and to be honest with you, the development community was sitting at the table with the regulatory community to discuss these issues. Obviously what you don't want to do is you don't want to curtail development. You want to encourage, still continue to encourage, development. Right now we're encouraging re-development and densification, so there are challenges that we have with all of that, and we just need to sit down collectively and explore that [so developers] can get a better understanding of what we're hearing from the community. TT: Do you think there are enough resources to make sure developers are following the criteria? COSTELLO: Some of the residents are saying that we don't have the resources to go out and police what has been done. If you drive around parts of the city, you'll get confirmation of that. The real question is that what do you do as a city to solve that. That's a policy decision that I hope to have some discussions with the mayor about. COSTELLO: As I've described it to everybody, here is my card and it says “Office of the Mayor.” Even though I don't have money or staff, I speak on behalf of the Mayor when I want to do something. In terms of allocation or reallocation of resources, obviously, I have to come up with a plan for him to evaluate and give him some options. If this was a symbolic position I would not have left my firm to come work for the mayor. TT: You’ve talked about pursuing smaller, less expensive, quick-hit projects — having response teams, for example, that would go out and deal with minor house flooding and that kind of thing. COSTELLO: There's a political goal here. What we want to do is we want to be able to touch as many people as possible because a lot of people don't see where [their tax] money is being spent. The question is: Do we spend on three or four $22 million dollar projects on an annual basis or do we spend on 20 $1 million dollar projects so that we touch more people? TT: How realistic do you think it is to assure people living in the 500-year floodplain — or even outside it — whose homes are flooding that anything can ever be done for them? COSTELLO: That's why you have to manage expectations, and that's why you have to be frank with them and say that anywhere in the city could flood at any time, because of the tropical nature of where we live. You can't build [channels and bayous] big enough to contain all the water. You can’t design for something like that. The question is: Is it better to wipe the whole neighborhood out and then make a green space? That's a balancing act that we have to try to figure out how to do it. TT: Is it possible to protect from something like a Tax Day flood? This Houston suburb is a magnet for growth and flooding. That's not a coincidence.